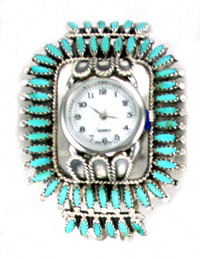 Sterling silver square needle point watch bracelet. Measures approximately 2" in width and 5" in length. Navajo handmade by Rosemary Tom-Nez. Color shade of turquoise may vary. Watch face will vary as well. Currently available with plain or bear face.